In the 70’s and 80’s in my house, Yuban was the coffee of choice. Needless to say, I grew up hating the smell of coffee. At the ripe old age of 20, I managed to break out of small-town America to go study in France for a year. European café life, with its exotic rituals and fascinating people-watching opportunities, had an irresistible pull on me. No laptops and tables for one…the experience was all about spending quality time with other humans. I was hooked. As with fine chocolates and wine, the palate and mouth feel are elements of the fine coffee-tasting experience. I drink my coffee so strong these days that I don’t think I could ever order a latte again (unless I was in the mood for flavored milk). From Blue Bottle to Intelligentsia to Ozo, I love trying new roasters and flavors. You don’t have to focus on the finer points of coffee to enjoy it, of course…many of us love coffee for the taste, as a ritual, and for its health benefits. Like dark chocolate, coffee is full of antioxidants; one 8-ounce cup of coffee (extraction details defined by the Specialty Coffee Association of America) has the same amount of antioxidants as three servings of blueberries. Studies also show that coffee can help reduce the risk of adult onset diabetes, has cardio-protective elements, and supports a healthy liver. My friend Denise is my go-to girl for all things soccer and coffee. 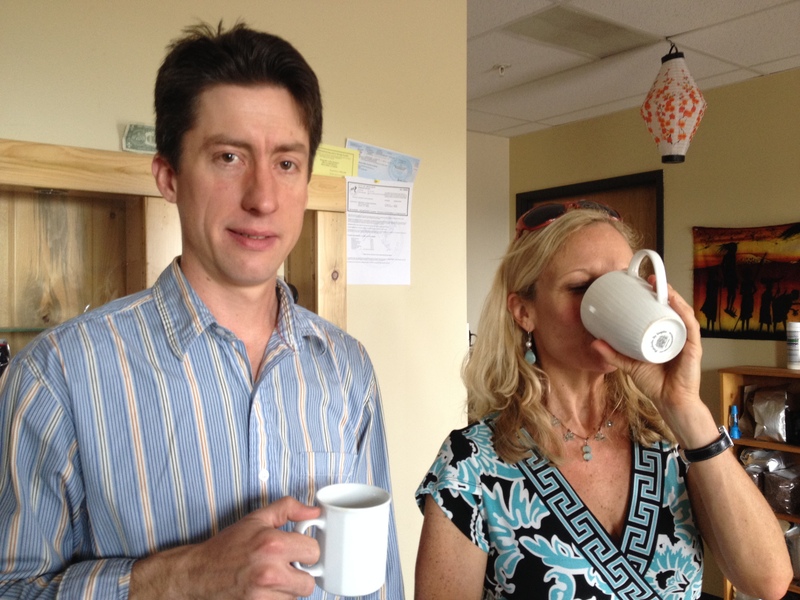 Knowing that I’m a coffee-loving food blogger, she suggested I investigate Dragonfly Coffee Roasters here in Boulder. A couple of weeks later, she joined me for a tasting hosted by Dragonfly’s owner Tamas Christman. 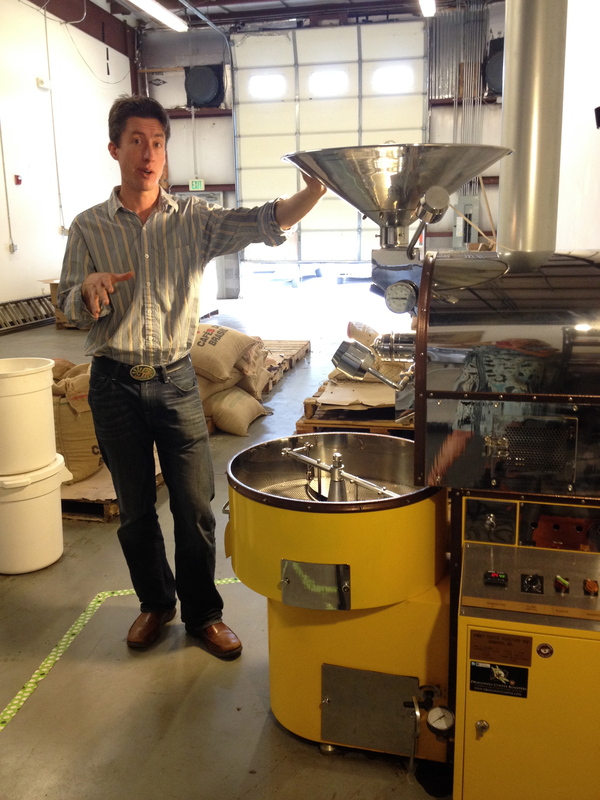 The roastery opened in 2011 and is located off of Lee Hill Drive. Tamas jokingly says wolves raised him— his parents founded and run Mission: Wolf, a wolf sanctuary in southern Colorado. He started roasting and learning about coffee there at age eight with the volunteers (he cut his teeth on Kona, and one of those long-ago volunteers is now his Orlando-based partner Joey). Tamas has degrees in computer science and chemical engineering, and it became obvious to me after an hour that his understanding of chemistry enables him to excel at roasting and brewing coffee. It’s so amazingly technical and complex, from climate to coffee cherry to process to roast to brew, with so many possible variations that you’ve got to have the kind of mind that lives and breathes science, nuance, details, and perfection. He’s found a superb intersection between his talents and his passion. Dragonfly’s custom-made coffee roaster is gorgeous, and was hand-built by a Turkish engineer. 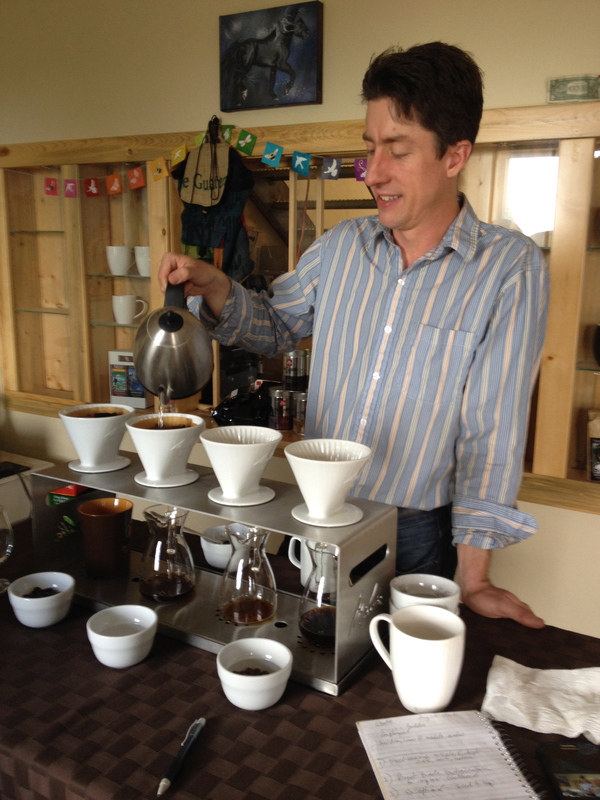 Tamas envisions his customers drinking his coffee while having good conversation and a fun experience. He cares how the coffee makes you feel. With each sip, you can experience a “taste of place” and the culture of the coffee’s country of origin. 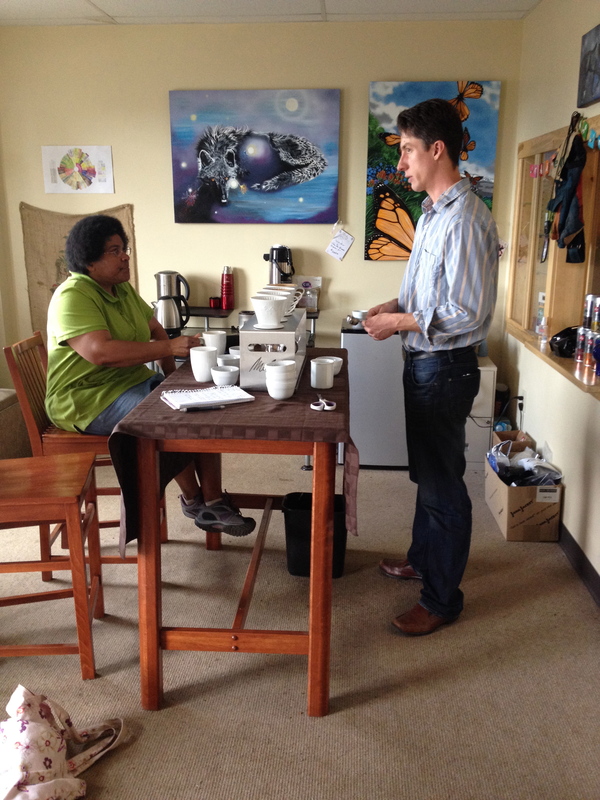 Equally important to Tamas is his commitment to curate and sell the top three percent of specialty coffees in the world. They limit their focus to five or six countries, roast outstanding coffee that virtually nobody else has access to, and they primarily do direct trade with farmers. Paying on average 33% more per pound, which allows the farm to completely change the way they work. This fair wage provides extra funding to improve sanitation and overall work conditions, provide steady work to locals, and in Nicaragua enabled the construction of new water wells and a library. Natural. The coffee cherry is ripe, picked, and not pulped. Dried on a raised bed produces a higher sugar content and more local flavors and climate elements imbued into the cherry. After drying, the pulp is ripped off and the mucilage (parchment) is cured for 30 days. Then, the parchment is milled off and is ready to roast. Taste? Rich, with a deep, juicy mouth feel, and creamy. To compare to wine, “natural” would be like a Cab or a Merlot. Fully washed. The cherry is pulped, fermented and washed, cured in parchment, then milled. Even if you used the same coffee cherry as with Natural, the taste would be 100% different. This one is crisp and tart, tasting of lemon or citrus or red fruit. Though the pH is the same as natural, there’s more perceived acidity. Because there’s a higher water content, this one would equate to a Chardonnay. Semi-washed. In between natural and fully washed (what’s this one called?). 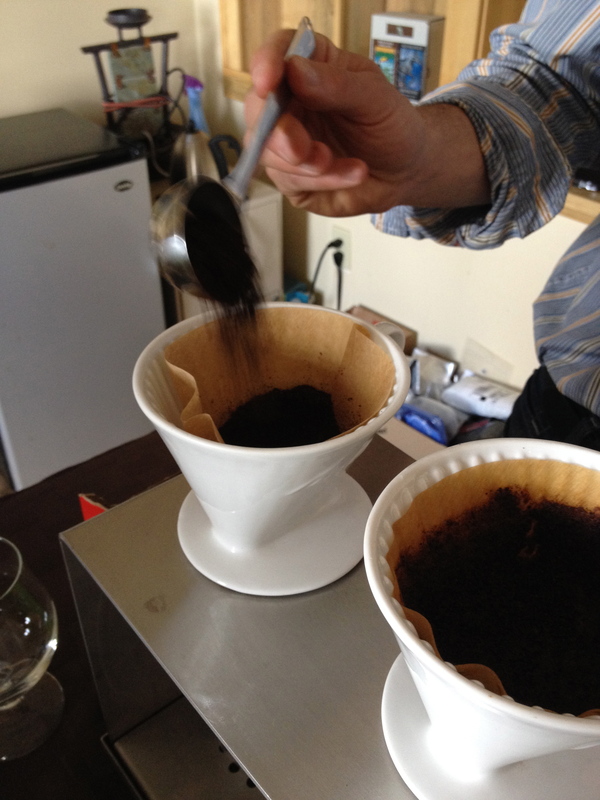 Taste: Medium roast that’s peaty, earthy, oaky, musty; many of these coffees come from Sumatra. Semi-washed natural, referred to as a “honey” process – pioneered in Panama. They rip up the pulp a bit, then let it dry with no rinse or wash. Once it’s out on drying bed, the pulp gets all sugary/carmelly; hence “honey” in the name. They plan to expand to 5-10 employees in the next year or so, offering their proprietary lines to cafes, restaurants, and retail locations. 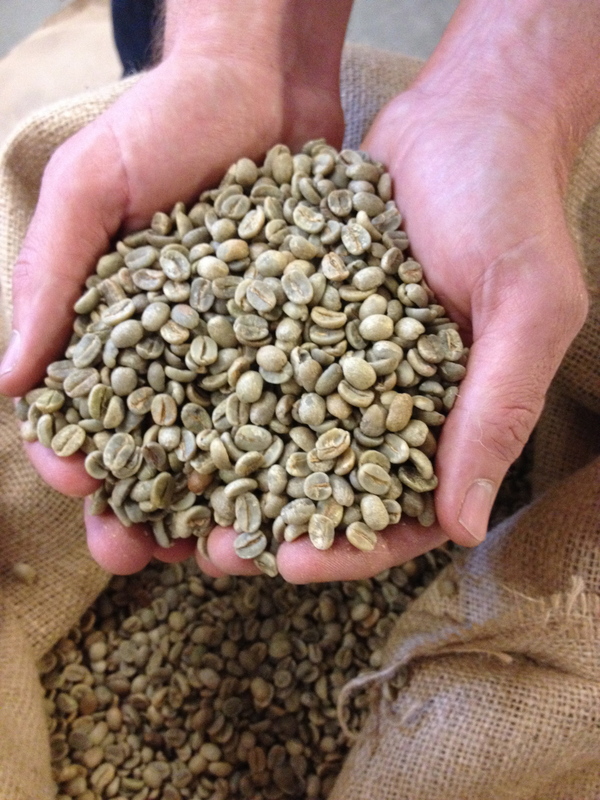 Colombian Supremo (medium roast) – grown in Huila, Colombia. Flavors: Chocolate, cinnamon, slight vanilla, nutty, delicate red fruit brightness. Big body, juicy, sweet. Indonesia Highlands Natural (single origin, medium-light roast). Flavors: Jolly Rancher Green Apple (per Tamas), caramel, cedar. Great mouthful, syrupy. Well, don’t just sit there dreaming of your next great cup of coffee….go get some!